Braved the number 1 tram to the Hermitage. As usual, it was insanely crowded and reeking of sweat and vodka. 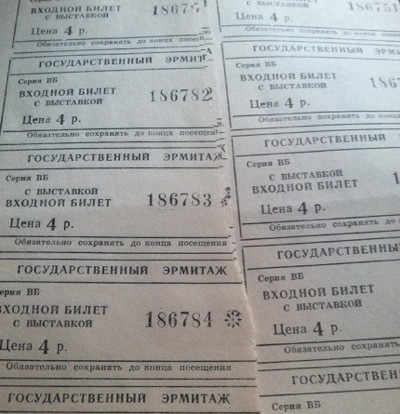 Long line to buy our tickets – sheets of paper equalling 200 rubles ($4). The Hermitage is a breathtakingly beautiful place, with its elaborate inlaid wood floors, high, vaulted gilded ceilings with paintings, both troupe l’oeil and otherwise. led to the Impressionists. There were Monets I had never seen before, including two incredible paintings of the garden at Giverny. I was transported back there as I gazed at them. There was a Renoir painting of his beautiful, radiant mistress dressed for the opera, which I had only seen in pictures before. There were beautiful Degas drawings of nudes, and a stunning Van Gogh painting of a garden, as well as some fine Rembrandts. We were surfeited by early afternoon and took a taxi back to the hotel. The taxi driver told Dad and Margaret that England must crush their own Communist party. He said that things were very hard now for Russians, with runaway inflation, no jobs, and no money. It’s a beautiful place, but buildings are falling into disrepair, the shops are empty, lines are long, and the people look so hopeless. The taxi driver hoped that things would be better for his children. In the evening, we went to the “Nobleman’s Palace”, formerly the residence of the Grand Duke Vladimir Romanov and built in the mid 1800s. Luckily the house was spared after the Revolution, becoming the scientists’ club, so it is exactly the way the Grand Duke left it. We were welcomed with champagne by a guide called Natalia, whose voice was like music. Her history of the house was translated by Evgenia, the Intourist guide. We were shown over most of the house – the kitchen and bedrooms were under repair – including the formal ballroom, a confection of white and gilt, and the dining room with its Murano glass chandelier. The concert was held in a room with copper chandeliers and walls of gypsum painted to look like oak. The first part of the program was a group singing and dancing to Russian folk songs. They used handmade instruments, including pipes shaped like birds. They had great energy and joy. At the intermission, we had champagne, peaches and truffles in a room paneled with elaborately carved wood. After this, we returned for the last part of the concert, which was wonderful – a famous Russian opera singer and her piano accompanist, whose hands moved like birds. The singer’s voice was glorious and she did an encore – I could have listened to her for hours. It was a magical evening I will never forget. After breakfast, we were loaded into red Intourist buses in the pouring rain and drove to the Catherine Palace in Pushkin. It is a beautiful, elaborate building painted turquoise, white, and gold. It belonged to Catherine the Great, and in her time, the parts painted gold were gilded with real gold leaf. The French Ambassador is reputed to have said that the palace was a treasure and needed a protective box. Catherine replied that she was the treasure and the palace was her protective box. 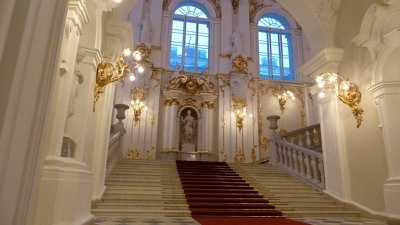 The palace was completely gutted during WWII, but has been perfectly restored to its original splendor. There were photos of the rooms circa 1944, and it’s hard to believe that these are the same rooms. I was surprised that the palace was so lovingly restored during the communist era since they were such symbols of decadence and were half-destroyed anyway. Fortunately, the Russian people are so proud of their heritage and craftsmanship that the palace was saved. We walked the marble and elaborately inlaid wooden floors in protective felt slippers over our shoes. We had lunch at the airport of all places, in a grand room with painted ceilings, classical columns, and elaborate moldings. After lunch, we visited palace of Catherine’s son, Paul. Apparently, she was not very fond of him and bought him this land three miles from Pushkin so he wouldn’t live with her. Paul’s palace is located in a town called Pavlosk. The palace is yellow and white, shaped like a semi-circle with a central dome, and is full of treasures, including Gobelin tapestries and Sèvres china which were gifts from Louis XVI and Marie Antoinette. There was almost too much richness and beauty to absorb. A YEAR AGO (2014): My boss meets the President! Also: the horrors of health insurance, an earthquake, and an unexpected visit from Audrey. Nice writing as usual Suzy, thanks for the ride, one feels like he’s there with your beautiful descriptions. So mush beauty and art and richness, unfortunately all to the cost of so many suffering because of the communist system of the time. It was just after the Communist era, but the country was in chaos at the time. Interesting times to be there! I realized that it was after the Communist era and yet, a very interesting time to see the contrast between the people and the State. Great souvenirs that you will cherish I’m sure. They were at a difficult point then. I wonder what it’s like there now. From what I can gather of the people I know that have been there or know someone, not much better, lots of fear amongst the people, no wonder with Putin as their leader, who can blame them.